The Schoellkopf Power House, erected in 1917 by the John P. Cowper Company and put into operation in 1918, is now scheduled for conversion and will be used as a rail museum. 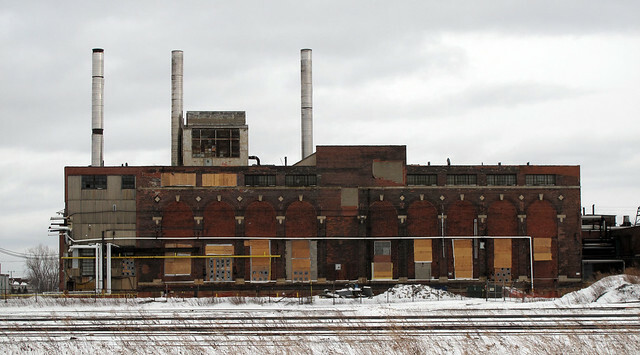 A recent view of the Schoellkopf Power House from the end of Prenatt Street looking east across the tracks. The industrial colossus located along the Buffalo River and home to Hanna Furnace, Republic Steel, the grain trade, National Aniline/Buffalo Color and countless other supporting service and manufacturing firms is now erie, quiet. The scape - looking in all directions - from the DL&W trestle and tracks (in the middle of the photograph) near the micro park at the end of Smith Street - is moving, especially in the context of what remains. Here's an aerial view, c. 1950. The Schoellkopf Power House is located in the upper left hand corner of the photograph. Two map images - here and here - depict a dense industrial landscape off Lee Street. Power houses around the world have been converted to other uses. The Tate Modern in London and The Power Plant in Toronto come to mind. 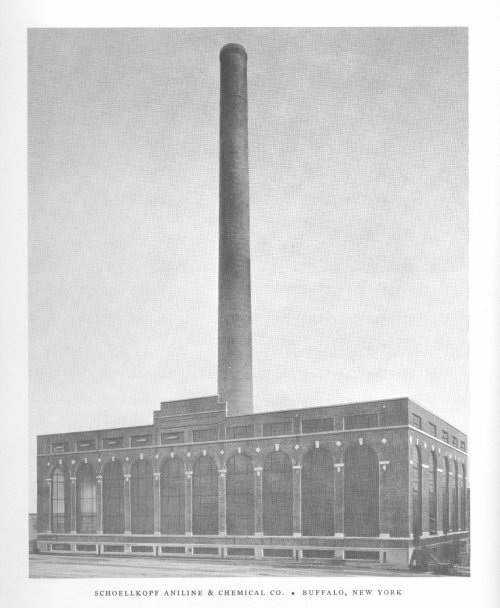 The reuse of the Schoellkopf Power House comes on the successful conversion of other former industrial spaces in Buffalo - The Packard, designed by Albert Kahn and Artspace- along Main Street. Robert Baptista has compiled an extensive history of this country's aniline dye industry. Here's the Buffalo section, tracing the origins from Jacob Schoellkopf in 1879 to Buffalo Color's plant closing in 2002. Buffalo News reporter Mark Sommer has the announcement and additional details in today's front page story about the new rail museum - here. I know this may fall into the twenty-twenty hindsight catagory but I am always amazed when I see a building, that was originally designed to be architecturally pleasing, turned into something quite ugly. I cannot imagine someone actually thinking: “Gee, why don’t we block-up those magnificent, light emitting windows and turn this building into something more industrial looking”. It comes down to money. In this case, it probably was "...how can we minimize the constant replacement of broken glass that the vandals are taking out by throwing rocks, since we are not here on-site 24/7 ..."
There have generally been two paths for powerhouse plants. b) stop generating power and are shut down and left to decay. The windows in this first path provided the needed ventilation and exhausting of excess heat from the process of burning the coal. The second path is the continued use of the powerhouse and eventual change to power generation via other fuels - oil or gas. The windows are no longer necessary as the amount of heat generated is not as much and to preserve heat, building, equipment; the windows are boarded or bricked/blocked over. The chimney stack may also be altered at this point too. Its how buildings learn, what happens after they're built. A new boiler system was installed and power generation was converted from coal to natural gas. I'm assuming the palladian windows were filled in with brick at that point. The plywood is new. Here's a pic from 10/08 showing the bricked windows. I was just wandering around this neighborhood the other day, trying to piece together what it used to be like. 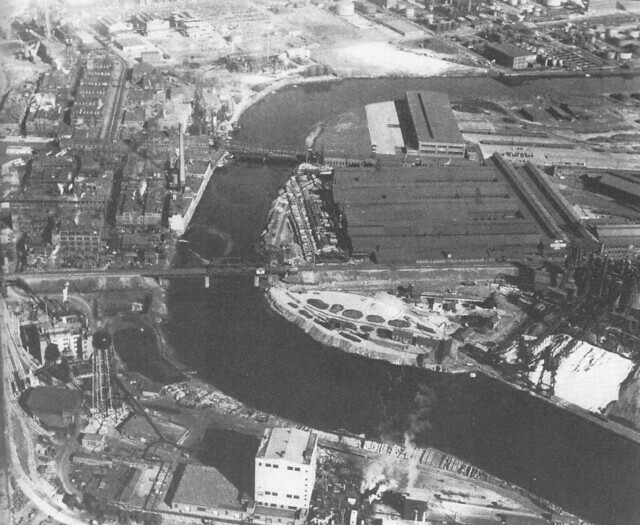 Do you know of any other pictures of the former industries along the river? Particularly the area on the north bank, west of the twin bascule bridges, where the micro park is now? Anon - Here's a link to an aerial map of the neighborhood and how it looked in 1958. Lee Street - with its noticeable kink - and the South Park bridge are still recognizable landmarks. The twin Norfolk Southern rr bridges - subject of a Charles Burchfield painting, Black Iron - are clearly visible. Republic Steel is across the river. The map works - slide it around - like google/bing maps. The Historic Aerials site has been recently upgraded and map navigation is now easier.